In this incredible season where pop music is under great scrutiny, a bevy of artists are migrating from the pop music culture into the annals of Gospel music. While this transition is by no means novel, perhaps the quality and caliber of the artists are what’s most noteworthy. Such mainstream artists as Dave Hollister, Kenny Lattimore & Chante Moore, and Kelly Price have all released gospel albums within six weeks of each other (in this Fall of 2006). Perhaps the most notable name in this mix is the platinum-selling trendsetter named Cheryl Clemons, known to many as Coko, lead singer of Sisters With Voices (SWV). GOSPELflava.com recently caught up with the trailblazer to talk about her career, her foray into gospel music, and her new album. Coko’s church experience was similar to many who grew up in the Pentecostal experience. With a strict upbringing, the transition into SWV was more of an expression of her dissatisfaction with church rather than a love for R&B music. While the SWV era of the early and late 90s yielded great success for Coko, it also produced areas of conflict related to her spiritual foundation. After three albums with SWV, her own solo project, and a plethora of chart-topping hits, Coko opted to take some time away from the industry. Coko began to enjoy life with a new marriage and family and had few concerns about resuming her musical career. But it was a musical contact that lit the fire that sparked her musical return. “It’s weird. One day, I saw James Robinson [of GOSPELflava.com] and he was just like, ‘If I ever get in that position, I’m going to sign you to do a gospel record.’ I was like, ‘Yeah, Ok.” People talk all the time, you know? Then, someone called me and told me that James was looking for me. I forgot how we finally got in contact, but we did. He told me, ‘I want to sign you. Remember what I said?’ [He was now VP of A&R at Light Records.] And I said, ‘Are you kidding me? Really?’"
Having been a prominent figure in R&B music for over a decade, the transition to the Gospel arena could be an interesting journey. Yet for Coko, it’s proven to be a welcomed adventure with great benefits for all of her followers. There are many believers who work within the secular music industry both behind the scenes and in artist capacities. While some have made the transition to sing exclusively Gospel, Coko doesn’t necessarily see that as the blueprint for all to follow. 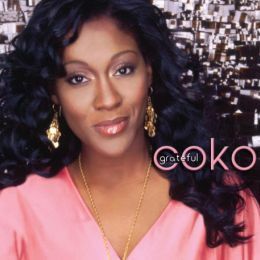 Coko’s full-length gospel debut is titled “Grateful” and features twelve songs that masterfully showcase Coko’s vocal prowess and musical style within a gospel context. The album launches with “Look At Me”, a cover of the Tramaine Hawkins’ classic of the same name. In addition, Coko covers another gospel classic, The Clark Sisters’ “Endow Me”. Connecting back with the group was a challenge for Coko. As an established veteran within the industry, the award-winning vocalist offers keen advice to those interested in entering the music game. While many encouraged and desired Coko to do a gospel project earlier in her career, she’s convinced that the timing then was not right. Being prepared spiritually for this new journey could not have happened without the presence of her new church family. Coko attributes her spiritual growth to her interaction with her local assembly. As things have come full circle for the artist, Coko is poised to make a significant impact on the musical world with her Gospel debut, adding another chapter to her remarkable career while cementing her legacy. All content in GOSPELflava.com © copyright 2006. No information to be reprinted or re-broadcast from this site without the expressed written consent of GOSPELflava.com. All rights reserved.